The actual path taken by the missing Flight 370 of Malaysia Airlines after it disappeared from the civilian radar can be drastically different from the path now being considered to be that of the aircraft. Path 1 shown below is the one accepted by the investigators for the time being and 2 is the path the aircraft might have covered actually. While Path 1 was plotted depending solely upon the radar data, Path 2 was developed considering both the radar data and another information more closer to reality, the eye witness accounts of a group of people and that of an individual. Time: Around 1.20 AM, 8th March. Eight villagers (of Marang) here lodged police reports Tuesday claiming that they had heard a loud noise last Saturday coming from the direction of Pulau Kapas. One of them, Alias Salleh, 36, said he and seven fellow villagers were seated on a bench about 400 metres from the Marang beach at 1.20 am when they heard the noise, which sounded like the fan of a jet engine. “The loud and frightening noise came from the north-east of Pulau Kapas and we ran in that direction to find out the cause. We looked around the Rhu Muda beach but did not see anything unusual,” said the lorry driver. It is evident from the timing, location and the direction, that it was MH370, which vanished from the civilian radar at 1.20 am, March, 8. Allowing a margin of 5-10 minutes, the zooming in of the plane could have happened a few minutes after the plane vanished from the civilian radar at point A. The eyewitness on the Marang beach seen the plane coming from the sea towards them. So the plane was coming from the ‘vanishing point’ back to the land. Must be too low. Something between 1000-2000 ft. Only a plane flying that low could be heard that loud. Note the men said they were so frightened by the voice that they ran. To where the plane was heading ? Time: Around 1.45 AM, 8th March. A businessman in Ketereh claimed that he saw a bright white light, believed to be of an aircraft, descending at high speed towards the South China Sea about 1.45am on the day flight MH370 went missing. Alif Fathi Abdul Hadi, 29, told the New Straits Times what he saw after lodging a report with the Malaysian Maritime Enforcement Agency (MMEA) in Tok Bali earlier today. If the men at Marang had seen the flight coming from the sea towards them, what Alif Fathi Abdul Hadi witnessed was a plane at a higher altitude, but descending, moving towards the sea. The sighting at Marang was around 1.20 AM. Alif saw the plane by around 1.45. The distance between the two locations is around 150 km. If it was MH370 itself, why 25 minutes to cover the short distance for a plane that can cover 550 km in an hour, even while descending ? The answer is the bizarre climb and dive by the plane said to have gone through, as detected by the Air Force radar. Radar readings had said the aircraft climbed to 45,000 feet after the ‘vanishing point’ A and then descended to about 20,000 feet. When Alif seen the plane, there were no frightening sound, only a white light moving away in the calm night. The altitude could have been something around 5000 to 10,000. But not 20,000. The discrepancy could be attributed to the errors that can creep in to radar readings when the object it tracks is farther. If these two eyewitness locations are joined (B to C), that will give the path of the plane after it returned to the land from the point above sea at which it vanished. It may be noted that the bearing of the track is approximately 330 degrees. On Mar 8th 2014 aviation sources in China reported that radar data suggest a steep and sudden descent of the aircraft, during which the track of the aircraft changed from 024 degrees to 333 degrees. The aircraft was estimated to contact Ho Chi Minh Control Canter (Vietnam) at 01:20L, but contact was never established. 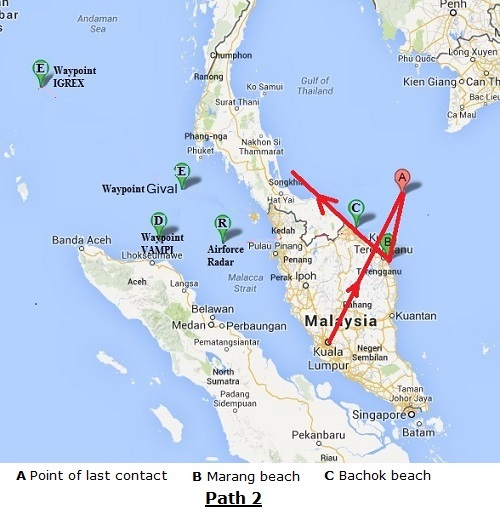 From A , the point of last contact to B, the Marang beach: Track changed from 24 to 204. Change in altitude: from 35,000 to 1500 feet. From B to C, the Bachok point: Change in altitude: Climbing from 1500 ft to 15,000 ft and then descending to an unknown altitude. Track: 330. 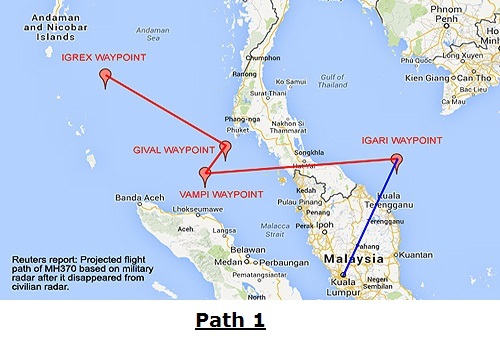 It can be seen that the official path is plotted based on the assumption that the jet followed the well known, published flight corridor that extent from way points to way points. Why this assumption? Mainly because the point at which it vanished from the civilian radar was too close to a waypoint called Igari (Latitude 065610N, Longitude 1033506E). The next sighting of the plane by the air force radar near the west coast. And there again was a way point: Vampi (Latitude N06105600, Longitude E097350800). By now, the analysts had reached a conclusion- MH370 was travelling along a definite flight path of which, by these two and the following were way points: Gival (Latitude N07000000, Longitude E098000000) and Igrex (Latitude N09432800 Longitude E094250000). So it was concluded that the flight was being guided by some one very familiar with navigation. The fact that track of the path between Gival and Igrex was 308 degrees further strengthened the speculation. 308 was more or less close to 333, the number already identified as the angle of the path of the object traced by the radar. But it can be seen that this chain of assumptions had taken MH370 much far from the more plausible path of the flight that could have been derived from a more reliable mix of data: Eyewitness accounts and the known radar data. It may be also noted that the path from Givel to Igrex and that from Marang to Bachok are almost parallel. Or, the tracks are almost identical for both paths. When the Air force radar read the track of the unknown flying object as 330, the object or MH370 could have been moving from Marang to Bachok and onwards. Not from Gival to Igrex as interpreted later by the investigators. If the flight indeed was proceeding along this newly plotted path, where it was heading to? The answer to the question is of course the key to solve this puzzle. It can be seen that not only the directions but the overall behavior too of the flight was entirely different from what is being said about the initial hours of the plane. After the transponder was switched off one minute before way point Igari, the plane was actually going back and descending to an alarmingly lower altitude. It was only after reaching above the land at altitude 1000-2000, that it climbed to 45,000 ft and dropped to 23,000 feet; not after it vanished from the civilian radar. After that part of the ‘journey’, it again traveled north-east and further descended. It didn’t go west to cross the peninsula or didn’t climb to 29,000 ft after the crossing, as the radar data interpreters now tell. So it obvious that, unlike what being widely believed now, the movements of the plane were never precise or calculated. And the highly erratic or frantic moves were sure indicators of an unexpected crisis on board. There were no strict adherence to a well defined flight path formed by a set of known way points. But only an alarmingly disoriented flying. Flight MH370 was sure not going to a secret terror rendezvous, but was only trying to escape from an impeding disaster. But, if the aircraft had indeed crashed soon, how come the pings or electronic shake hands between a satellite and the plane for at least another six hours? There of course an explanation: For the satellite to pick up, the plane need not be airborne. A running engine was sufficient. Where ever it was. After 8.11 in the morning of 8th March, 2014 (the time of last ping from the satellite to the aircraft), there were no information/communication from the plane or its passengers. All the analysis/theories now we have are based on the happenings before 8.11 AM, March 8. What could be the implication of the fact that absolutely no new developments/events after the morning of 8th? What could be the meaning of the total silence from the other side of the curtain beyond which 239 human beings and a modern jet liner had gone in the early hours of March 8, 2014? Why no communication between possible terror cells leaked out during these 10 days preceding the incident? Seems the answer is obvious. There were no conspiracy, no planning, no hijacking and no terror attack. It was a plain, simple case of an air crash. Most probably in land. « Flight MH370 crashed in the forests of Peninsular Malaysia ?